Call out bright ideas with a splash of colour and use brilliant fluorescent yellow, pink, green and blue highlighters. Easily underline, circle and highlight books, notes, and keywords with the molded chiseled tip that won't fray or mush. Call out bright ideas with a splash of colour and use brilliant fluorescent yellow, pink, green and blue highlighters. Easily underline, circle and highlight books, notes, and keywords with the molded chiseled tip that won't fray or mush. Wield the Desk-Style highlighter confidently while the multi-faceted cap sits securely in the bottom. The improved highlighter formula means you can leave the cap off for up to a week and still keep highlighting with ease. 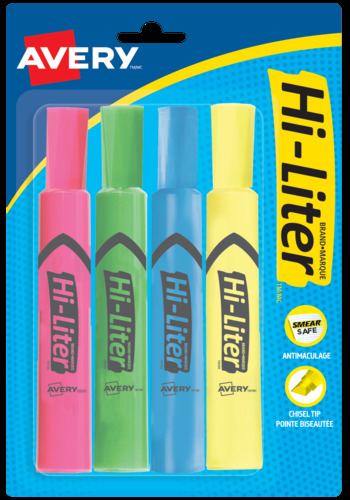 Trust the ORIGINAL HI-LITER® . We guarantee you'll appreciate using this bright idea maker every day.